Springtime, Rain, and Special Announcement. It has been raining. I am so happy for the rain. I love rain. It is the #1 reason I would want to live in the Pacific Northwest of the U.S....but then I would miss our other interesting weather stuff here. The other day I got rained out headed to the lake but I still managed to stop at the park and take photos in it. I want to make art about our climate issues. not anything that may take a political side per se, there is a bigger issue at hand, simply the fact that this year is predicted to be hotter and yield less rain and all Oklahomans regardless of their political affiliation or background are watching the weather, as this is affecting our local economy and environment. I have gathered many sketches and small pieces from natural spots already to inform future works over the summer on this topic. I have been inspired by some wonderful sculptural pieces in the past that deal with water distribution and history will be writing about those when I get some more time. Rain means the #2 reason I would want to live in a rainier, more perpetually Springy climate...mushrooms. Oklahoma has indigenous to our climate one of the most sought after wild mushrooms in the U.S. and midwest, the morel, or morchella genera. There are a few species- yellow/black/half-free/blushing... and we get mostly yellow ones here, around the rivers and creeks and cottonwoods, elm, and cedar trees. When I was growing up my best friend's grandmother would go hunt morels on the river by our town and take her sometimes and we would eat them fried. 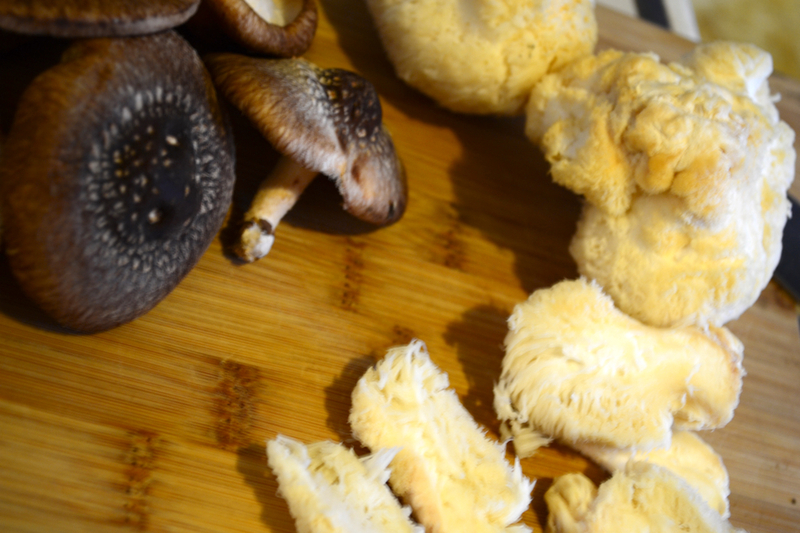 I was able to get some fresh shiitake the other day, and lions mane -the white one- we have never had it before and it was tasty!! There is a foraging culture that is becoming more trendy, so much larger areas such as Central Park question it's place in the urban environment. I follow a group called Oklahoma Wildcrafting that teaches ethical foraging and education about the native plants and mushrooms, and how to use the ones that most people think are just invasive weeds. It is one more little connection to growing up on my grandparents' farm while still living in the city. 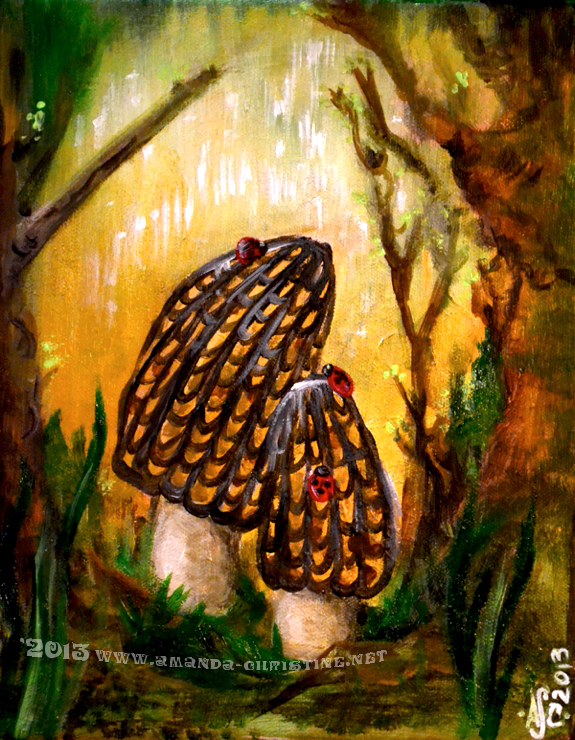 I have the above painting of black morels and ladybugs listed in my Etsy Art Shop... I painted away some of my "mushroom fever" in one afternoon... but that's not all I'm doing. Anyone who has followed my photos has known I have taken mushroom photos for a few years, since before I could identify the obvious ones, and I have snuck a few peeks of some small sculptural pieces on my social media and Google Plus accounts as well.. I am opening a *special shop* for photos and mini sculptures and a few other items related to my nature addiction! I will still be selling fine art as well but photos and other small gifts related to mushrooms and a few fantasy pieces (can't be in the forest without a little bit of fantasy)... Be sure to connect with this shop's Facebook and blog for all the listing updates if you share this addiction with me, and you can click the link below to go directly to the shop once it's live!! I have a little bit of everything planned and a LOT already to list so we will see how this goes!